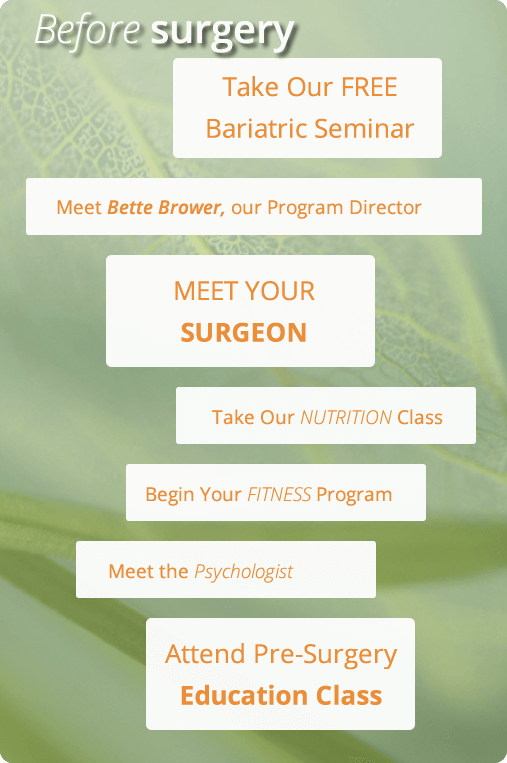 At Southern Oregon Bariatric Center we understand your desire to reach you goals. We also understand that success after bariatric surgery begins long before the surgery ever takes place and continues forever after. Honestly, there is no finish line. Rather, there are many milestones to pass along the way. Each milestone represents another opportunity to learn and grow, allowing you to move forward with greater understanding and confidence. Our comprehensive program is designed to journey along with you as you approach, reach, and move on to your next great milestone. Here is a general overview of our program. Consider this overview your compass. It is there to guide you in the general direction you should be heading, but never so much that you miss some of your own milestones of discovery along the way. Attend our Free Monthly Bariatric Seminar. Meet with our program coordinator, Bette Brower, for a formal one-on-one introduction to our program. Attend the nutrition class offered by Reeger Cortell, FNP. Complete pre-surgery medical weight management (if required). Attend any one (or more) of the five, free, ongoing, monthly bariatric support groups. Meet with a clinical psychologist. Begin your activity/movement program with Damon of Baxter Fitness. Meet with the Registered Dietitians to review pre- and post-surgery nutrition and vitamins. Obtain your protein shakes and vitamins according to the SOBC protocol. Attend the pre-surgery educational class led by registered nurse, Reeger Cortell, FNP. Meet with the pre-anesthesia clinic. Begin the pre-surgery liquid diet on the appointed day. Day of surgery: Check in at Asante Rogue Regional Medical Center at your appointed time. After surgery: Stay in a private room with a private bathroom and a sleeping couch for a family member or friend. 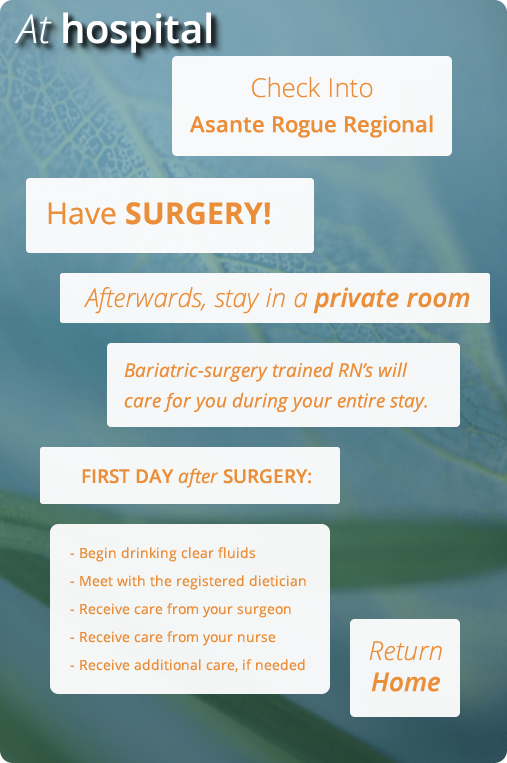 Be cared for by bariatric-surgery trained RN’s during your entire stay. First day after surgery: Begin drinking clear fluids according to the SOBC protocol. Receive evaluation and care from respiratory therapists who assist with CPAP and breathing treatments, if needed. Receive evaluation and care from physical therapists, if needed. Meet with the registered dietician during your hospital stay for a Q&A session. Receive evaluation and care from your surgeon and nurse practitioner. Discharge home the first or second day after surgery (Note: Depending on the type of surgery, and on a case-by-case basis, you may be discharged home on the same day of the surgery). After discharge continue advancing your nutrition, hydration, activity, and vitamins according to the SOBC protocol. 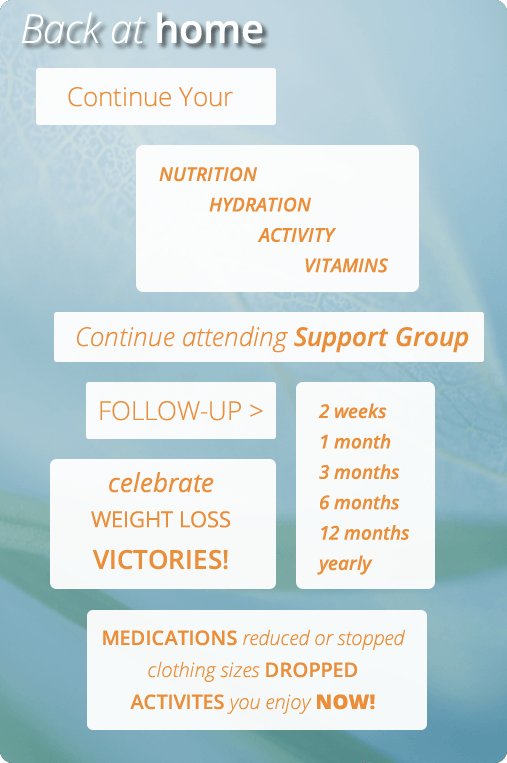 Continue attending free monthly bariatric support groups. Return for follow-up within 14 days of surgery then at 1 month, 3 months, 6 months, 12 months, and yearly after that. Labs will often be ordered before your visits and reviewed with you at the visit. At your follow-up visits, we review not only your weight loss but also your non-scale weight victories (NSV!) such as medications reduced or stopped, clothing sizes dropped, activities your are now participating in and enjoying that you were not able to enjoy before your weight loss. What are your new activities? You tell us! What’s on your bucket list? For the first time in my life I feel normal. I had been overweight for as long as I can remember, but I now weigh less than I did in junior high. What I lost in weight, I gained in character. It’s been an emotional journey, but I have arrived as a better mother, wife, and friend to those I care about.